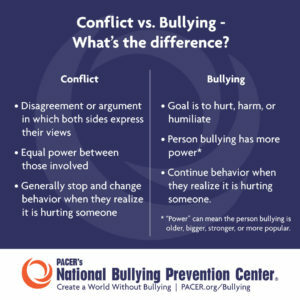 Bullying is different from conflict. Bullying is done with a goal to hurt, harm, or humiliate. With bullying, there is often a power imbalance between the students involved, with power defined as elevated social status, being physically larger, or as part of a group against an individual. Students who bully perceive their target as vulnerable in some way and often find satisfaction in harming them. In normal conflict, students self-monitor their behavior. They read cues to know if lines are crossed, and then modify their behavior in response. Those guided by empathy usually realize they have hurt someone and will want to stop their negative behavior. On the other hand, students intending to cause harm and whose behavior goes beyond normal conflict will continue their behavior even when they know it’s hurting someone. 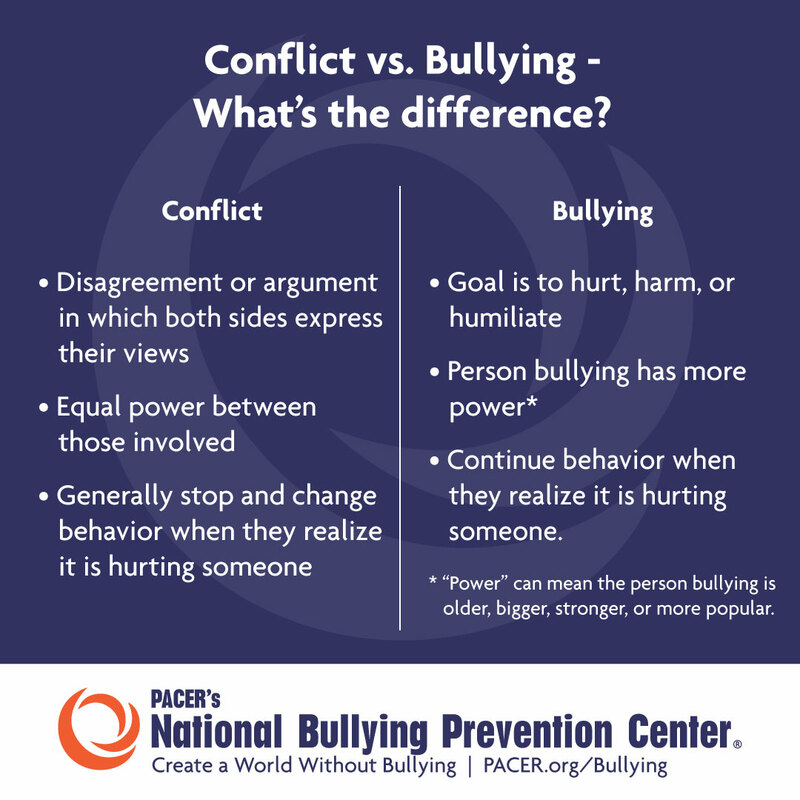 Sometimes people think that bullying and conflict are the same thing, but they aren’t. In one way or another, conflict is a part of everyday experience, in which we navigate the complexities of how we interact. Typically minor conflicts don’t make someone feel unsafe or threatened. Bullying, on the other hand, is a behavior with intention to hurt, harm or humiliate and the person targeted is not able to make it stop. Teen author from the “Ask Jamie” column shares her thoughts on how conflict is different than bullying. In one way or another, conflict is a part of everyday experience. Even if it is something small, which it typically is, there is the constant navigation of the complexities of human relationships. This is normal, and minor conflicts typically don’t make someone feel unsafe or threatened. Are we equals in this situation? Do I feel victimized or targeted by an individual or a group? Do I feel that the person or group has intentionally hurt or humiliated me? Sometimes, it can be easy to minimize a bullying situation because you don’t really want to deal with the realities of what is happening to you. It is easy to get into a pattern of qualifying bullying as conflict in order to avoid facing the actual problem, when really it is something that you don’t deserve and something that requires outside intervention. It can be helpful to ask these questions to yourself, as it can help you sort out the reality of your particular situation. A question from Zoey, an elementary school student, who wants to know more about how to be kind.